Gap Sale is now on across everything online! Enjoy the sale today. Gap is renowned for its simple yet cool styles. The brand's three letter logo is known across the whole world and pretty much everywhere you go, you'll see someone wearing one of its classic hoodies or tees. By checking out Gap's range you'll notice that consistency is key. The brand's range has evolved greatly in recent years, but its core values remain the same. Gap also prides itself as a label that does not exclude anyone. Whether you're city girl looking for cute skirt for a night on the tiles, or married woman in need of maternity and babywear, Gap has a range to match your requirements. 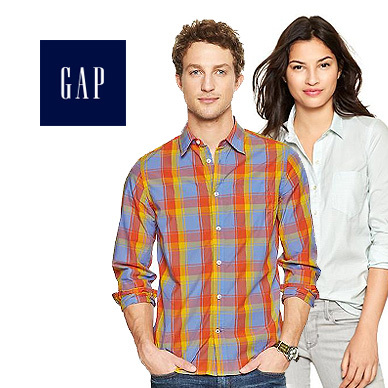 Add GAP to your Favourites list and be the first to know every time they have a Sale on! 1st January 2018 - GAP New Years Day sales for 2018. 7th May 2018 - GAP Early May Bank Holiday sales for 2018, add to your diary now! July 2018 - GAP Summer 2018 sales, joining us? 23rd November 2018 - GAP Black Friday sales in 2018 start on Friday 24th November. Add products from GAP to your Love Sales list. Get the Love Sales button now! Gap January Sale is now on across everything online! Enjoy the sale today. Gap Boxing day Sale is now on across everything online! Enjoy the sale today. Gap Christmas Sale is now on across everything online! Enjoy the sale today. Gap November 50% off Sale is now on across everything online! Enjoy the sale today. Gap Cyber Monday Event is now on across everything online! Enjoy the sale today.